Join us in essential, interdisciplinary research to help eliminate health disparities among minorities. 2018 Minority Health Disparities REU students. In this program, each project has unique prerequisites. See project descriptions below for details. 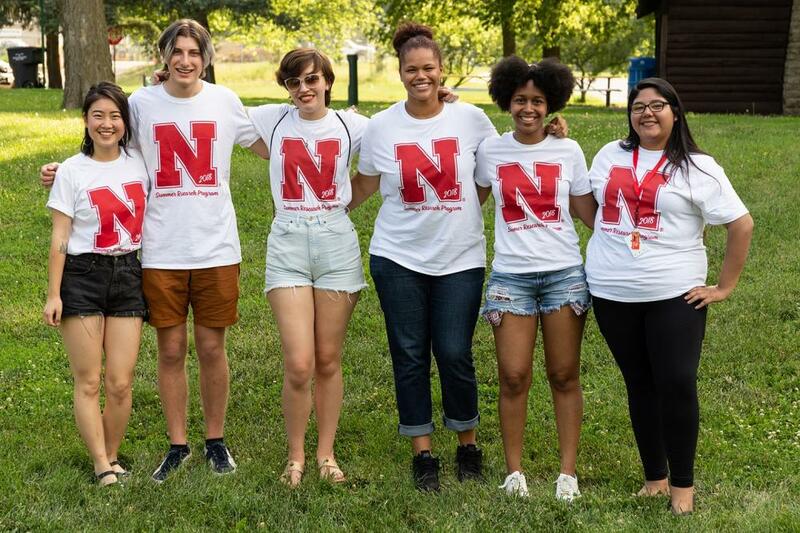 The University of Nebraska-Lincoln Minority Health Disparities Initiative (MHDI) administers the Minority Health Disparities REU, which is an interdisciplinary program aimed at conducting cutting edge social and behavioral research into understanding and reducing health disparities and in diversifying minority health researchers. 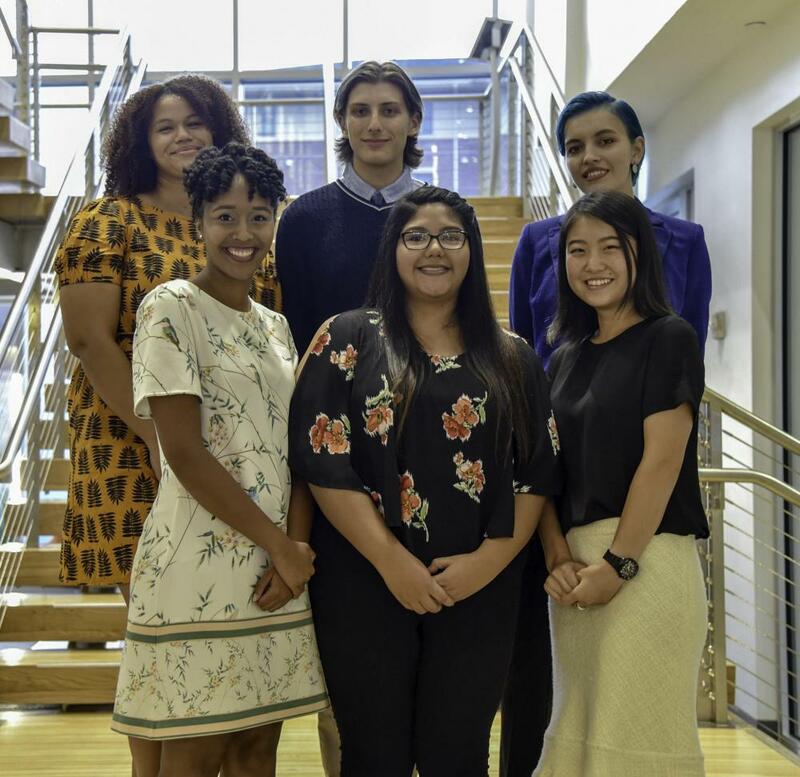 This project takes place under support of a Summer REU grant from the National Science Foundation for research in social network analysis (SNA) and minority health. As part of that program, participating students will learn basic approaches to network science/SNA in order to employ these skills where possible in their summer research projects. SNA instruction will take place during a 2-week intensive class led by Kirk Dombrowski (Professor of Sociology, UNL), scheduled for the first two weeks of the program. Training will be used to enrich the students experience in their partner laboratories during the subsequent 8 weeks. The primary student outcome of this part of the summer research experience will be an introductory facility in social network terminology, visualization, and exploration. 2018 Minority Health Disparities REU students at the end-of-year banquet. Participating students work with faculty mentors in a variety of social and behavioral science disciplines to support health research. All projects are on-going, but the work specific to the summer research program will be completed within the 10-week timeframe. At the conclusion of the program, participants will present their research at the Summer Research Symposium poster session. This project investigates the social network contexts of HIV and HCV infection drawing on data from four rural communities in Puerto Rico collected in 2014-5. The emphasis of this project will be on the use of block modeling and network statistical analysis to isolate indicators of high risk that result from dyadic relationships among injectors and the injection “roles” that result from these interactions. In the process, the student will help document HIV and HCV prevalence and incidence for injecting drug users in the region, which in turn will be used by the research team to develop a framework for interventions aimed at these unique problems. The most recent HIV surveillance data from the Centers for Disease Control indicates that Puerto Rico hosts one of the highest incidences of HIV infection in the United States. In 2010, the territory reported 28.2 new HIV infections per 100,000 residents, a rate over 1.5 times that of the US average and the third highest among all 56 US states and dependent territories. Yet among 103 major metropolitan areas, San Juan was ranked only 20th in terms of new diagnoses of HIV in the same year. In Puerto Rico, rural rather than urban communities, contribute disproportionately to the overall HIV rate. Further, over 20 percent of new diagnoses in Puerto Rico listed injection drug use as their cause, compared to 8.3 percent in the continental US. Clearly, these discrepancies point to a very different epidemic than what we are used to seeing on the US mainland, where HIV infection remains largely an urban problem. The extent and underlying behavioral and network structural causes of this rural epidemic remain largely unknown. This project investigates the social network contexts of HIV and HCV infection drawing on data from four rural communities in Puerto Rico collected in 2014-5. The emphasis of this project will be on the use of block modeling and network statistical analysis to isolate indicators of high risk that result from dyadic relationships among injectors and the injection “roles” that result from these interactions. In the process, the student will help document HIV and HCV prevalence and incidence for injecting drug users in the region, which in turn will be used by the research team to develop a framework for interventions aimed at these unique problems. This project investigates eight social network domains of the residents of the Northern community of Nain, Labrador. Socio-demographic and network data were collected between January and June, 2010 from interviews with 330 adult residents. The emphasis of this project will be on the use of network descriptive techniques and statistical analysis to study the relationships between these network domains. A community emerges from the social relationships that bind its members to one another. These relationships are constructed and maintained through specific actions that constitute network domains. Family ties are an example of one network domain. Most network studies focus on measuring the structure of a single network domain which limits our understanding of how relations cumulate into community structure. This study improves upon this by collecting data from the same set of actors across multiple network domains. The eight network domains under study in this project are Country Food Assistance, Non-Country Food Assistance, Jobs, Housing, Household Wellness & Domestic Violence, Traditional Inuit Knowledge, Family and Alcohol Co-Use. The primary purpose of this study is to investigate the structure of each domain and whether and how individuals’ positions in one domain relate to their position in the others. Understanding the dependencies across the various network domains will allow us to achieve a more nuanced understanding of how the multiplexity of social networks creates ambiguity – protecting individuals from isolation and exposing them to risk simultaneously. We can then examine how this ambiguity relates to substantive outcomes such as domestic violence, alcohol abuse and suicide within the community. This project is aimed at addressing suicide risks among Alaska Native youth through a community-based participatory research (CBPR) prevention program – Promoting Community Conversations about Research to end Suicide (PC CARES). Data were collected in two villages of northern Alaska between 2015 and 2016. A total of 300 social network interviews were conducted using an in-person tablet interview. Data were collected using the Social Network Analysis through Perceptual Tomography (SNAPT) software developed by the research team here at UNL. Data includes traditional social network data of self-reported relationships, and also includes perceptual networks for different helping networks. The combination of this unique data collection effort and non-traditional perceptual networks has the potential to improve social network methodologies and also provides rich data to explore nuance of helping networks and dependency structures perceived by the community members for intervention and prevention purposes. Students will have the opportunity to identify community structures and individual characteristics within multiple networks that has potential for real-time community feedback. Additionally, students will have the opportunity to evaluate the impacts of the prevention program to identify areas that communities have exceled to reduce suicide and find localized processes of the PC CARES program that can be reevaluated with the community for future improvements to the program. Results will likely point to important understandings in the social settings in which AI/AN suicides take place, and novel renderings of one or more network measures within the SNAPT paradigm.